Now 30% OFF in the Crochet Spot Store, this hat can be crocheted in 5 different sizes from babies to adults so that everyone in the family can have a fun hat. The hat is crocheted in one piece from the top down, then the tree trims are crocheted direct onto the hat so that no sewing is required. 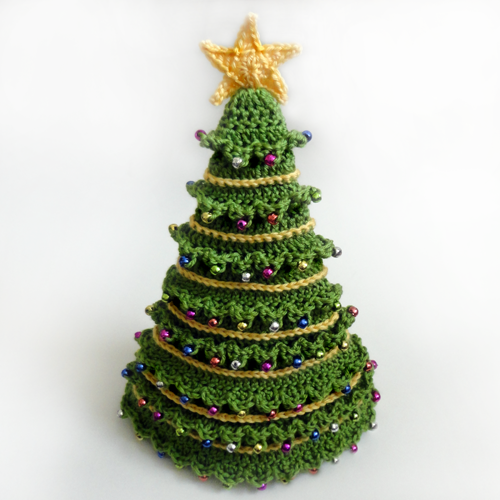 The trims are crocheted with colorful beads, which are used as ornaments. The star is then crocheted separately, and then sewn onto the top of the hat. Due to the techniques used in this pattern, it is not recommended for beginners unless you’re up for a fun challenge! Pattern is already marked down. There is no need for coupon codes. Log in, then add the pattern to your cart and check out. All purchases can be downloaded directly from your account once completed. Offer ends November 15, 2018. This entry was posted on Thursday, November 8th, 2018 at 12:00 AM by Rachel Choi	and is filed under News. You can follow any responses to this entry through the RSS 2.0 feed. You can skip to the end and leave a response. Pinging is currently not allowed. What a sweet hat! This would be perfect for a baby’s first Christmas.